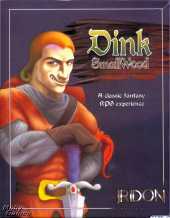 In this low budget Diablo style RPG you play Dink Smallwood.When Dink's world gets swarmed with monsters you must stand up and try to put a stop to it. The gameplay is very simple and can be controlled with a keyboard, joystick, or gamepad. Kill monsters, talk to people, and cast spells. In 2011, a newly remixed version called Dink Smallwood HD came out with: complete re-mastered original CD soundtrack; "speed up" button to fly through dialog and cutscenes at your own pace; automatic full state save/restore whenever you quit/restart the game; quick save/load feature takes the frustration out of dying; comprehensive in-game add-on support with one click install and play; upgraded engine with a rewritten GL renderer and with antialiasing and other optimizations, to make Dink look and sound better; and three control methods, directional pad and "drag anywhere", and Fling mode.